This post was submitted Greater City: Providence reader Peter Brassard. If you’ve written something you’d like us to consider posting, please contact us and let us know. Rhode Island’s commuter rail service as currently conceived may not be conducive to encouraging ridership. Distances between existing and proposed stations are too far. Much of the focus has been on extending the system further into low-density suburbs. For Rhode Island commuter rail to succeed, more needs to be done to take advantage of existing walkable urban neighborhoods that have a high potential for passengers. Some of these areas have large amounts of commercial/industrial space or development opportunities. Due to Downtown Providence expansion, the rail system will be challenged, as long as there’s no internal downtown high-frequency transit, such as the proposed Core Connector, to directly link rail passengers to the far reaches of downtown. Rhode Island’s commuter rail doesn’t capitalize on density variations and neighborhood assets of the Providence area. If Rhode Island’s commuter rail functioned as a rapid mass-transit system, besides increasing the number of passengers, it would help to revitalize and expand development opportunities for neighborhoods along the rail line. The implementation of medium frequency shuttle train service within the Rhode Island instate rail corridor would offer predictable headway times at regular intervals that could operate in addition to MBTA commuter and Amtrak trains. Air and intercity train travelers, commuters, and the general public would greatly benefit from this level of service. A variation to a commuter rail or shuttle train is the German S-bahn or French RER or San Francisco’s BART. An S-bahn type system is usually the same as commuter rail in suburban areas, but differs when it’s within the central urban core, where it has characteristics of a subway or metro. Usually stations within the core zone are located close together at quarter- to half-mile subway station distances and schedule headway times typically fall somewhere in the middle of commuter rail and subway schedules. Depending on the city, central core rail infrastructure can be underground or at grade utilizing existing rail corridors. A hybrid of a shuttle train and an S-bahn might be best for Rhode Island. One way to organize Rhode Island’s rail system would be to create different station tiers allowing for various levels of service and investment in station infrastructure. Tier service levels could be thought about as intercity or express (Amtrak), regional or limited (MBTA), and local (RI Shuttle trains). Shuttle trains should be able to stop at all stations and MBTA trains should have stops at major commuter and Amtrak stations. The hours of operation of a shuttle train should extend to weekends and late evening at all stations. Because a shuttle train schedule would be frequent and regular, it would relieve the need to increase the number of MBTA commuter trains for Rhode Island transit needs or having to extend MBTA weekend service south of Providence. Shuttle train stations should require a lower level of investment. Platforms could be adjacent to the freight track. Priority should be given to constructing affordable shuttle train infill stations without automotive accommodations. An infill train station could consist of as little as a single high-level concrete platform with stairs, handicapped ramp, railings, partial canopy, lighting, and signage. Some stations might require an elevator instead of a ramp for ADA access. Without the land acquisition and construction costs for parking, drop-off facilities, station buildings, or pedestrian bridges, the cost range for a barebones single 300-foot long infill platform with modest accessories should cost between $500,000 to $1-million. A typical 900-foot long platform would be roughly $2 to $4-million. Because of increased service frequency, a shuttle train could have fewer cars and utilize shorter platforms that could be extended in the future, reducing the initial infrastructure investment. Shorter trains and platforms would allow the system to develop incrementally as ridership increases. Infill stations should mostly be located within high-density urban neighborhoods where people can either walk or take existing bus transit to stations with limited or no automotive infrastructure. To optimize use by pedestrian’s stations should be designed so that they would have direct access from sidewalks of major streets with bus routes. Major streets and bus routes can act as siphons to funnel potential passengers from adjacent neighborhoods to stations. Bus routes that intersect the rail line corridor would effectively extend the passenger capture area of a walkable neighborhood. A passenger capture area would be the total population that’s within less than a 12-minute walk and/or a 7-minute bus ride to a train station. Infill stations could become catalysts to renew employment opportunities in older industrial neighborhoods, reinforcing economic development. Lower income people from urban neighborhoods would be able to commute without needing a car. A series of stations served by frequent shuttle train service would create true rapid transit for Rhode Island passengers to quickly reach jobs or homes in adjacent cities or distant neighborhoods, not possible with the bus system. The increased use of commuter/shuttle trains would reduce traffic congestion and lower air pollution. Opportunities to concentrate additional employment and population around stations would help to limit the expansion of suburban sprawl. There is historic precedence of having closely situated train stations within Providence documented on city maps from 1918. In addition to Union Station, previous train stations existed at Atwells Avenue, in Olneyville at Westminster Street (northbound) and Dyke Street (southbound), Cranston Street, and in Elmwood. There are likely other forgotten stations outside of Providence. I remember being told as a boy that my great-grandfather would regularly take the train to Providence from Woodlawn in Pawtucket. As late as the 1960s there were the ruins of a wooden stairway leading down to the tracks at Lonsdale and Mineral Spring Avenues. Currently proposed urban infill stations are 300 Barton Street in Pawtucket, Olneyville, and Park Avenue in Cranston. Other potential infill stations could include Central Falls and in Providence at Reservoir Avenue, Cranston Street, Atwells Avenue, and Charles Street. Also Hunt Street, Mineral Spring Avenue, Branch Avenue, Dean Street, Union, and Roger Williams Avenues could be considered. Suburban industrial infill stations could be built toward the northern end of Jefferson Boulevard and Davisville/Quonset though these locations might require additional bus shuttle service. There would be infill station opportunities with the Lincoln and Cumberland villages along the Blackstone River, for when train service would be extended to Woonsocket. A station at Route 116 with elevators and escalators reaching to the Washington Highway bridge deck would allow passengers to access buses to Lincoln and Smithfield’s office region. The map shows potential shuttle train stops within walkable urban neighborhoods. Distances between stops are generally at half-mile intervals. Base bus system map courtesy of RIPTA. Click image to enlarge. Olneyville’s potential for a high number of passengers should be a top priority. The current proposal for Olneyville locates a platform on Harris Avenue, away from the Broadway and Westminster Street bus routes. This location was likely chosen because construction costs would be low. A direct access walkway/ramp to the Harris Avenue platform from Broadway and Westminster should be provided, which could be developed through easements with the abutting commercial property and elderly high-rise south of the proposed platform. From looking at census tract data and existing bus routes the passenger capture area for Olneyville is probably the highest with roughly 28,000 people who could reach the station in less than a 12-minute walk and/or 7-minute bus ride. If only 5% of that population used the train that would equal 1,400 people or up to 2,800 passenger trips per day. Olneyville also has over a million square feet of commercial/industrial space, much of which is vacant or underutilized, plus vacant land for new development within walking distance from the station location. Pawtucket officials and RIDOT favor the 300 Barton Street location for a Downtown Pawtucket station. Fewer people would be within walking distance of this station, but bus service would expand its passenger capture area of roughly 13,000 to 15,000 people. The lower western quadrant of Central Falls would be walkable to this station. Development opportunities would be great for Downtown Pawtucket. RIDOT/VHB’s proposed 2009 Option “A” plan would be preferable, as both proposed station platforms would have direct access to Dexter Street’s sidewalks and buses without requiring a special drop-off circle for buses within the parking lot. Option “B” should be rejected as it isolates the station creating a condition favorable to automobiles and access to Dexter Street would be indirect and circuitous for pedestrians, which might limit opportunities for smart growth development in Downtown Pawtucket. The current plans to include a parking lot and vehicle drop-off area, though expensive should probably remain, since Pawtucket is a regional center and would be a major MBTA station. In the future the current proposed parking lot could be upgraded to a multi-level structured facility. In Central Falls a rail platform located near Sacred Heart Avenue would serve the eastern half of Central Falls and some of Pawtucket north of downtown. Roughly 8,000 people would be within walking distance of this station, which would not have pedestrian overlap with the proposed Barton Street Station in Pawtucket. The adjacent Central Falls neighborhoods that would benefit are among the poorest and highest density communities in the state. This station location should be considered in addition to Barton Street. Other infill station possibilities include a Cranston Street station, which would have a passenger capture of roughly 13,000 to 15,000 people in Providence and Cranston. The Huntington Industrial Park on Niantic Avenue has about a million square feet of commercial/industrial space, some of which has been converted to offices. Not that it’s necessarily practical to rebuild the entire district, but the Huntington Industrial Park is built-out to a small fraction of what is permitted by current zoning. The Corliss Industrial Park at Charles Street has similarities to the Huntington Industrial Park. A Charles Street station would have an approximate capture area of about 15,000 to 17,000 people. Passengers would be more reliant on arriving by bus from the North End-Charles Street area, Wanskuck, and Elmhurst, since the potential for passengers walking to the station might be more limited. Providence Streetcar at Empire Street. Reservoir Avenue near Adelaide would have a capture area of about 14,000 to 16,000 people in Elmwood and the Reservoir Triangle extended by bus to parts of Cranston, South Providence, and the West End. An Atwells Avenue station might only have a capture area of 5,000 to 6,000 residents, but a station platform at this location would be a critical link to Atwells Avenue restaurant/retail tourism district, as well as, commercial and industrial space in the Eagle Square vicinity and residential neighborhoods in the Valley area, parts of Federal Hill, Lower Mount Pleasant and Olneyville. A Cranston station located at or near Park Avenue would have a rough capture area of 6,000 people from Cranston, South Elmwood, and Warwick. If a Park Avenue bus route were reinstated for the full length of the avenue, the station’s passenger capture area could be further expanded. This location would likely be a major MBTA commuter station and require automotive access and parking facilities. To justify the construction costs for the TF Green and Wickford commuter rail stations and parking facilities, there should be as many commuters destined for Providence as for Boston. It is possible for commuters to access distant employment areas within the Boston/Cambridge area because Boston’s subway extends the reach of commuter rail stations. The expanded Downtown Providence area will be handicapped as several of the city’s employment areas are beyond reasonable walking distance and underserved by bus transit. It’s essential to build at least a portion of the Core Connector to make Providence Station viable as a destination commuter rail station. Maximum interconnectivity to multiple stations with a large potential passenger base is the key to creating a robust rail system. The current blueprint for Rhode Island commuter rail is limited. To revive older neighborhoods and improve the state’s economic base, the rail system should serve more than just Providence and Boston commuters and intercity train travelers. Providing a handful of expensive commuter rail stations, most of which are in low-density suburbs, is not enough to substantially increase commuter train ridership and insure the success of the system. It would have to be confirmed, but it’s likely that between Central Falls and Cranston there are 100,000 people that could reach the rail line by a short walk or bus ride. It may be unconventional to propose constructing inexpensive infill train stations geared toward pedestrians and bus riders without parking, who would be served by shuttle trains, but it would transform Rhode Island’s rail system into rapid mass-transit, as well as, commuter and intercity rail. Besides being economical, urban infill stations could be built quickly. Since platforms are relatively low cost and there’s a present need to improve the regularity of train service between Providence and the airport, rather than spending years on studies, conducting a pilot program where a few or several urban infill stations could be built would be worth testing. All passenger types would benefit with this truly competitive alternative to driving within the core metro area. The passenger base for RIPTA buses would be reinforced and expanded, as would MBTA commuter trains. There may be objections from Amtrak and the MBTA or others regarding close proximity of stations and frequency of service. Since Amtrak schedules are on one- or two-hour intervals and MBTA trains run approximately on the half hour at weekday peak and less frequently at other times, urban infill stations and shuttle train service operating mostly on the freight track shouldn’t interfere with either agency. The advantages of developing a rapid-transit rail spine for Rhode Island’s people and economy would outweigh any objections. Awesome post! I love that map; how were you able to download a RIPTA system map, though? I can only view it online. A five or ten minute walk to the train station along pleasant streets is one thing. A evening walk from Depasquale Square to the proposed Dean St station is another. The desolation of many proposed stations, especially Branch, Charles, Dean and Roger Williams Park will be too hard to fix. Those five minute walks to actual neighborhoods and destinations feel like a grim half hour. I admire this detailed exploration of how to make the most intensive use of our existing rail corridor. It might be appropriate someday. Meanwhile, if the goal is to transform travel patterns in existing densely populated areas and trigger some brownfield development, a few new MBTA stops are in order but the requisite high frequency local service must pass closer to the doors of homes and businesses. I much appreciate Peter’s post of a vision for using our (mostly) existing rail infrastructure that is original, reasonable, and capable of generating widespread interest – unlike the “core connector” streetcar that I think is too narrowly focused to excite a significant number of folks. I also applaud inclusion of the bus routes on his map, as this is often overlooked by rail enthusiasts. While ambitious for a metro area of our size, it could seem more practical and more urgent if oil gets substantially more expensive. I also wonder if some proposed stations are too closely spaced. At any rate, someone familiar with rail dispatching would have to analyze the mixing of commuter, shuttle, and freight trains on the FRIP track. Prioritizing infill stations over the extension of commuter rail to low-density Kingston and Westerly areas seems reasonable to me. Perhaps a first step might be infill stations just in East Greenwich, Cranston, and Pawtucket on the existing commuter rail. But even before that, I think advocates need to help make that commuter rail reasonably successful (worthy of another post) or otherwise there won’t be political will for further investments in our rail system. And even before that, the MBTA and RIPTA operating deficits that threaten existing services need to be addressed, and soon. Andrew: one of the main things I disagree with Peter on this is the frequency and location of stops, for the reason you specify. We discussed Branch and Charles in email; my belief is that they should be consolidated into a single stop at Providence Plaza, precisely because there’s hardly any residential development that’s pleasantly walkable to either. I added the more marginal stations towards the end of writing the piece, suspecting that I would get flack for adding them. My intent was to engage debate on a shuttle train and in particular urban infill stations. What probably would make the most sense is to locate stations based on the 1918 map. They were the best locations then and probably still are today. As for Dean Street, the station was less about connecting to Federal Hill and more about linking to the office and industrial space along the river where there are also development opportunities. It would be nice to have some way to get to the zoo and Roger Williams Av was as close as stop on the line could get. There has been some negative reaction to this idea already from the rail advocacy community. Constructive comments have included the need for two platforms at each station and with the addition of shuttle service the corridor should be expanded to four tracks. The question with proposing four tracks, is that the current track locations are set up for high speed rail (HSR) asymmetrically and there’s no room for a fourth track unless everything gets ripped out and we start over. Was that suggestion just a way to kill the idea? Rather than shuttle trains and infill stations, perhaps the debate should be about the rail priorities within the inner urban core. If HSR prohibits using the rail corridor for anything other than high speed and suburban commuter trains, what is the effect on the neighborhoods along the line and the city and state’s economy? Is there any reason why trains have to go faster than 100 mph for the eight-mile long stretch of Providence and Pawtucket? It’s all a matter of how good schedule adherence is. If Amtrak could stick to schedule, then even with a future speed upgrade, electrified local trains and intercity trains could be accommodated with four-tracking only in Cranston and Warwick. This is based on interlining MBTA and RI train, with timed overtakes at Readville-Route 128, Attleboro, and Providence. It’s even possible to shoehorn a Woonsocket-Providence shuttle into this edifice, but it’d be very tight at the Providence end. 1. To minimize intercity travel time, it’s best to maximize track superelevation, as it offers an almost free speed upgrade. Best preexisting industry practice is to have tighter rules on cant excess at stations, about 100 mm, than on cant deficiency; there’s no basis for disallowing 150 mm cant excess for passenger trains, but a) no agency that I know of allows that, and b) the maximum is 200, and on the tight curves at Atwells and between Union and Cranston, this makes some difference. It’s measured in seconds, but making up those seconds anywhere else costs a lot more. 2. More overtakes make the schedule more vulnerable, and in practice this means more schedule padding. The only reason to do two overtakes between Boston and Providence is that one overtake makes the schedule too tight. Three overtakes are still possible, but more difficult. 3. Building platforms at those infill stations is going to require some track reconfiguration, and even ROW widening if the platforms are of a certain width. If this is already done, they might as well widen everything to 20 meters plus platform width at stations and four-track the entire corridor. For consideration, I’d like to add, that at current, the area in which the 1918 Elmwood Station stop existed would be a great expansion of the commuter rail service with focus on the now vacant Mashapaug Commons retail center. Here, the lot contains a large parking area and retail space which could be transformed easily with the addition of a train platform into a Wickford Junction style rail-to-retail station and commuter depot. Here the commons are located near or on the original Elmwood station stop and is quickly and easily accessible from RT 10 and I95 with nearby routes 6 and I295 further connecting commuters inbound to Providence/Boston and points south without having to go north into the city. I’d also recommend connecting a commuter station stop here with a pedestrian tunnel or right-of-way to Columbus Square at Elmwood and Reservoir on the eastern side of the tracks which would further encourage economic growth. I’m not a fan of surface parking, however this maybe a good use of existing infrastructure, satisfy part time auto users and to help revitalization as well as eduction of mass transit through community integration. Why not add some ZipCars and bike stations as well? What is the use of the freight rail like? A non-compliant DMU would require time-slicing a freight line between the passenger and freight use in any event, and would avoid running around the regional / Amtrak corridor ~ especially Amtrak, where problems as far south as Virginia can propagate to schedule slips. Single track with short passing loops makes for a rigid shuttle schedule, but would leave single shuttle platforms viable. Then depending on freight scheduling, a single compliant train could run a two-hourly night train to keep the network open during the freight portion of the time slice. That could be a regional commuter between its last outbound of the evening and its first inbound of the morning. @Andy, Your idea of an Elmwood stop incorporating the relatively new defunct shopping center to mirror Wickford Jct. is a good one. For non-neighborhood driving commuters, Cranston-Park Av. would have better highway access. Columbus Sq. is walkable at few short blocks, so there’s no need for a tunnel. The Reservoir Av. bridge has a right-of-way for six tracks beneath it. So there’s plenty of room for a platform(s), where the station could be accessed from Reservoir Avenue’s sidewalks directly. @BruceMcF, Someone else would have to speak to the scheduling of freight and passenger trains, I don’t know the frequency, but currently the freight track is used for freight during the day and at night. A subway or elevated tracks would be ridiculously expensive, which the Feds would have no appetite in paying for. Proposing to carve a new rail surface right-of-way through the heart of the Providence area is disingenuous and cynical, and about as crazy as proposing plowing a fresh new interstate through the heart of the city. Any notion that it might be possible to build urban infill stations served by shuttle trains affordably appears to be out of the question according to RIARP. So does that leave us with discarding the exiting asymmetrical 3-track configuration and replacing it with four tracks? As Alon suggested, would it be possible to widen the tight spots of the right-of-way to 20m (66-feet)? Central Falls to Park Avenue Cranston is 10-miles (16km). What would the cost per mile be to rebuild the 3-track corridor to 4-track, plus replacing four or five bridges? I’m going to post this discussion at my place, because at least one issue (freight scheduling) I think my commenters know more about. Specifically, freight and local commuter trains have similar average speed, and so can be safely mixed on the same tracks as long as frequency is not too high (if it is, the different speed profiles – start-and-stop for the commuter train and steady slow going for the freight train – interfere with each other). I do not know what that frequency is. Any chance of seeking out of state leaders on these issues. Seems that Rhode Island can never get its crap together or finds reasons not able to do something. Am I an idealist who still thinks that “If we build it they will come.” or “If they can do it why/so can’t we!” mentality. I hate “no” especially when we’ve had it before. Great idea for platform access. I’d envision direct pedestrian access from either side of the bridge down to inbound and outbound platforms, respectively. Alon points out that the Providence Institute study I’d looked at before addresses the freight question. A freight curfew is not really an option … partly because the freight seems to be scheduling around one or more Boston area peak hour freight curfew, so there are several 8am freight trains coming down the line. So single track with passing either between or at stations is not an option for the entire corridor, though at 15min service frequency a single track / single platform section remains an option if there is an especially expensive stretch for double tracking a combined freight/shuttle line. And the shuttle would likely need to be electric, to get appropriate shuttle performance out of heavy freight compliant passenger trains. I think it’s disingenuous to say that the focus of commuter rail in RI has been to ‘extend into low-density suburbs.’ That’s never been the focus, in my opinion. It’s been an EFFECT of the commuter rail expansion, but the actual focus has been a service that spans the state from end to end. Should that service be a far-flung extension of the MBTA commuter rail? Absolutely not. There’s no reason whatsoever for the MBTA to go farther than Providence. Fortunately, RI isn’t asking for that – and with the money already allocated, accepted and ready to be spent on much needed improvements to existing stations at Kingston and Westerly, the stage is set for the MBTA to be pared back to Providence and for RIDOT/RIPTA to start operating its own line. The crux of the matter is this – while I agree that some proposed infill stations (hello, West Davisville) are extraneous, that doesn’t mean there should be no commuter rail in the southern half of Rhode Island, especially not when the majority of the infrastructure to support it is there already and what infrastructure isn’t has been paid for and will be constructed soon. I guess what I’m trying to ask in a roundabout way is – why? Why abort South County Commuter Rail so close to its completion? Why argue that there’s no benefit to connecting all corners of the state to each other? A single surface parking space cost $15,000 and structured or garage space costs $25,000. So far the state has spent $336 million on just two commuter rail stations, both of which are not meeting ridership projections. Most of the money was spent on parking. Kingston will likely be more successful since it’s further away and has URI’s population to support it. The parking lot at the station is often filled and the overflow has to park on a grass area on the north side of Route 138. I’m not saying that service shouldn’t be extended to Kingston or south, because the money has already been allocated, but as soon as service is extended there’ll be a bond request for $20- or $30-million to build a garage. Hello, Quonset/Davisville is only two thirds built out and 8,600 people work there. How many of those workers take the #14 from Providence or Pawtucket and then walk a couple of miles to get to jobs? Maybe I shouldn’t have mentioned the Blackstone Valley, but the Lincoln and Cumberland villages are urban, as is Woonsocket. Valley Falls is effectively an extension of Central Falls and Manville is filled with three to six unit 3-deckers and mill row houses within walking distance of the P&W track. The point of this piece is that 130,000 people between Central Falls and Cranston who live less than a mile of the track are underserved by the current rail system. Without parking urban infill stations should cost less to construct and develop higher ridership numbers more quickly than what has been demonstrated so far with the suburban stations. The worst thing that could happen is that the commuter rail system doesn’t meet ridership expectations, which would be an excuse for some to say that commuter rail doesn’t work in Rhode Island and the state wasted all that money that should have been spent on roads instead. So far the state has spent $336 million on just two commuter rail stations, both of which are not meeting ridership projections. Most of the money was spent on parking. This is enough to make me think that their only vision for transit is “substitute a train ride for one leg of a car trip.” Transit investments that make car travel (better yet, car ownership) superfluous are beyond their imagination. I couldn’t agree more with you, Peter. Ryan, the point is that we’re building the most expensive leg of this project to serve the fewest number of people, who are the least likely to use the service, and without having constructed all of the logical anchor points. Why would we want to spend hundreds of millions of dollars for “end to end” state service when we could have spent just $100M dollars to service more people, who are more likely to take transit, where there are more jobs, and greater likelihood to have the positive spillover effects of transit-oriented development? Even if we assumed the same costs per rider of the extensions south, the far lower potential for transit-oriented development would still make it more costly in the long run with less of an impact on the overall economy. We should take on the task of the easy, cheap infill with far higher services levels before we imagine the magical North Kingstown resident ready to ride to Woonsocket for jobs that don’t exist yet. Peter: I blame the MBTA for a large part of the ridership not performing to expectations, with several trains that still don’t reach Wickford and several, notable holes in the schedule – no 10:30~10:45 departure, or 4:25~4:40, or 5:30~5:45 – all of which would line up with a train originating from Providence. In the other direction, there’s a four hour hole between ~9 am and ~1 pm, followed by several two hour gaps. However, I don’t fault the cash-strapped MBTA for targeting their farthest-flung services for initial budget saving measures, nor do I fault them for the impending fare hike that will hurt the struggling performance numbers and has pushed at least one person (that being me) to switch to Amtrak out of Kingston instead. The MBTA, though doing everything they can to kill the service, is doing what they must to survive. But RIDOT needs to take over for the service as soon as possible to stop the backslide – but I maintain faith that they will. Andrew: This, as in all things, takes time. The state’s still pretty solidly auto-centric and has developed to be that way. 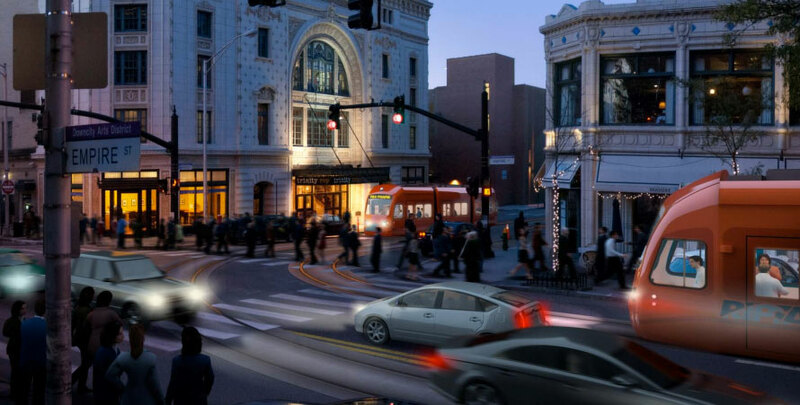 In time, as development is encouraged along the commuter rail corridor, car ownership will start to look superfluous. This isn’t the kind of thing that goes from one hundred to nothing in a matter of days – it’s going to take months or even years for the auto mentality to subside. But it will subside. Patience, and encouraging growth and transit-oriented development in all parts of the state – not just half of it – is going to be key. In the meantime, the worst thing we can do is say things like ‘it’s just not happening FAST enough’ or ‘the wrong kind of ridership is being attracted.’ For now, we need those people deciding to substitute a train ride for one leg of a car trip, and deciding that this is a service they’ll be using regularly. Jason: There’s a saying I’m fond of: you don’t build a farm in the middle of nowhere and wait for someone to pave a road to it, you pave the road and invite someone to build a farm at the end of it. Westerly and Kingston are not the issue, because Westerly Station is right in the middle of the city of Westerly and Kingston is performing well enough that skipping over Wickford Junction entirely and extending service straight there would have likely been a far more immediately beneficial investment of money, but that’s neither here nor there. Wickford Junction was built and it’s certainly not going to be bulldozed any time soon, regardless of whether or not I would have saved that station for a future infill – and it’s in many ways a blank slate just waiting to be developed, and a few feeder buses away from bringing people to and from East Greenwich, Wakefield, Narragansett, and the state’s excellent beaches. I disagree that there’s no potential for transit-oriented development in the south half of the state. If you build it, people will come. Why choose between dealing with the politics of business in Providence or locating in the middle of nowhere – build near Kingston, or Wickford Junction, or in East/West Greenwich or Coventry and get the benefits of easy transit access without the drawbacks. And, since I’ve brought up politics… this is a state-run service that the whole state will be paying for. That’s the value in having it run end to end – because it would benefit the entire state, not just parts of it at the expense of the rest. And in a state 50 miles long by 35 miles wide, you can’t afford to discard half the state as only being worth paying for the service. Ryan, I applaud your optimism, but I don’t understand why, noting how autocentric things are right now, we’d go after the strongholds of this culture before bringing neighborhoods that are on the cusp of being transit-ready into the fold. We’re just skipping all of the low-hanging fruit that will demonstrate ridership success and meet the cost requirements for maintaining service. I’m not understanding why anyone would think RIDOT would be the better operator of this service. RIDOT has no money and has no experience running a railroad. How would they be better? Jason: Because I really do feel that just extending service to Westerly is a far lower hanging fruit at this point, and because I’m the type of jaded cynic who can’t help but feel like shifting gears towards a shuttle line at this point is only going to serve to rile up the kind of opposition coalition that’s been known to exist down in the lower half of the state, resulting in the worst case scenario: the project getting killed entirely. And I’m not suggesting that it’s going to be, should be or needs to be an either/or proposition. I think we can have both things, and in time, we will. The only problem I had with this is that I read into it as ‘do this instead of activating Kingston/Westerly’ – and that’s what I had a problem with. As an aside, something else I’ve forgotten to mention until now: we’ve got a standing agreement with CDOT. As soon as SOMEBODY starts running trains to Westerly, the Shore Line East gets extended there as well. Jef: RIDOT is probably smart enough to subcontract out, and to do so with someone OTHER than MBCR, so that’s one thing for them and against the MBTA. The MBTA itself is probably in a much deeper hole than RIDOT is or has ever been, and RI’s services make for an easy target for cuts every time things get tight over there in MA. And you can bet this isn’t going to be the last time things get tight over there. So, dumping the T protects us from being the victims of budget balancing, another strike against the MBTA and for RIDOT. The MBTA is raising fares. As far as I know service didn’t get cut in Rhode Island, where service was cut elsewhere in the system. The Providence line has the highest ridership and Providence is one of the few places where reverse commuting occurs, which helps pay for the run to Boston. The reason the MBTA has financial problems is because the agency was saddled with a substantial amount of debt for mitigation projects for the Big Dig highway tunnels. So if Rhode Island were to ditch the MBTA, does that mean that Rhode Island has to buy the MBTA’s equipment or take over the leases on the double decker trains? Would Rhode Island have to pay user fees to use the tracks in Massachusetts that are owned by the commonwealth? Peter: When I suggest ditching the MBTA, I mean in terms of operating everything south of Providence – the arrangement I’m thinking of is RIDOT, or a RIDOT subcontractor, operating trains painted/emblazoned as RIDOT (RIPTA?) trains on through service Westerly-Woonsocket, with the MBTA still running trains on the Providence/Stoughton line – but only into Providence Station. Potentially, Pawtucket/Central Falls would be served by MBTA and RIDOT, or bypassed. Fortunately, Amtrak owns the entirety of the NEC in Rhode Island, so there shouldn’t be any track-lease problems from the new arrangement, and Rhode Island would only need to buy MBTA equipment if they were unable to secure a better deal from another contract. RIDOT subcontracting out the service does not solve the problem that RIDOT is broke. If we subcontracted, we’d have to pay the subcontractor. Also, wouldn’t it end up costing more if we subcontracted out to someone other than MBCR (or whoever the T ends up signing their next contract with)? Why would we duplicate a whole bureaucracy just to run trains between Providence and Westerly? RIDOT is first and foremost a road agency, and regardless of all that Michael Lewis says about us not being able to build more highways, rebuilding highways will come before trains within that agency for a long time to come. As for rolling stock, the fact is we already own quite a bit as part of our arrangement with the T, along with the other things that Peter mentioned, this helps insulate us from the financial problems the T is experiencing to a degree. And, our agreement with Massachusetts and the fact that RIDOT does not run the rail in the state has probably saved us from RIDOT cutting services. As for Shore Line East, if we have an agreement with them, I’d love to see it. As far as I know expanding service into RI is something that Shore Line East is thinking about in terms of long range planning, but there is no agreement that if we get local trains to Westerly, that will automatically trigger them to meet them. Jef: Subcontracting out to someone other than MBCR nicely avoids a problem of there only being so many trains available. Subcontracting to Amtrak directly solves the problem of having to replicate bureaucracy. You make a good point about us already owning the rolling stock, however, and I’m not going to lose any sleep over those trains keeping the MBTA paint job. My concern is mostly in that while the T does benefit a good deal from reverse commuters into Providence, they’re only benefiting because one end of those people’s transit experience is inside MA. They stand to benefit a lot less from people remaining entirely intra-state on their commutes. RIDOT is a transportation agency, overseeing all modes of transportation. From what I can tell based on perusing their website, they’re surprisingly proactive with regards to better rail service / public transportation in the state. They’re certainly not ignoring the roads (and the roads are in need of repair), but roads aren’t coming at the expense of everything else. Yet. Again, I remain optimistic. There’s a reason the T stopped subcontracting to Amtrak. Technically, RIDOT does run trains in Rhode Island, they are simply completely hands off by having an agreement with the T and the T subcontracts to MBCR. I can’t see how it would be beneficial at this time for us to abandon that arrangement with the T to subcontract the service out to someone else ourselves. Jef: Even us subcontracting to MBCR directly instead of subcontracting through the T is a preferable arrangement, in my mind. Beneficial at this time? Maybe, maybe not, but I’m thinking proactively: it’d almost certainly be more beneficial to do so in five or ten years. One advantage of doing it through RIPTA is that it streamlines some administrative functions, like fares, schedules, and customer service. 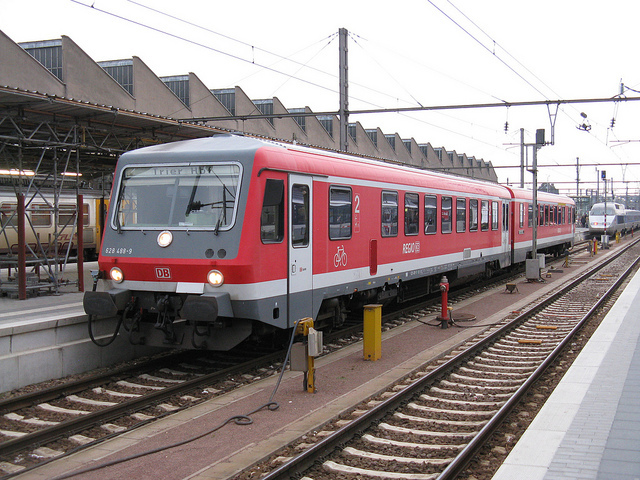 If the rolling stock is DMUs rather than EMUs, it can also streamline maintenance: German DMUs usually run in small-scale operations by state and local agencies similar to RIPTA, and so are designed to be maintained in the same shops as buses and with many interchangeable spare parts. Who RIPTA chooses to subcontract this to is a different matter, but best industry practice here is free transfers, mode-neutral fares, and integrated timetables. As for Westerly, that’s practically intercity service. The city may be in Rhode Island, but its strongest commute ties are to Connecticut – after itself, its top commute destination towns are Groton, Stonington, and Ledyard. It has 4,000 CT-bound commuters, and only 2,100 bound for the rest of RI (of whom only 750 are outside South County). This is not the same as Woonsocket; after itself its top commute destination town is Franklin, but Providence is a close second with 1,200, and there are another 1,000 to Pawtucket, Warwick, and Cranston. And there’s also the in-between – not that North Kingstown and South Kingstown are that different in commute numbers from Cumberland and Lincoln, but their development clusters around potential station locations better. And more importantly, service toward Woonsocket means running on freight tracks at approximately the same speed as the freight train because of all the stops; service toward Westerly means running on high-speed tracks at a speed that would completely muck up intercity service. I would prefer us build further regionalism within New England rather than dismantling regionalism we already have. The MBTA has its hands full between subways, buses, commuter rail, ferries, etc. I say take the Commuter Rail away from the MBTA to create a New England regional rail authority, keep Rhode Island service in there and add Shoreline East, proposed New Haven-Springfield line, extensions to southern New Hampshire, take over the Downeaster if that proves prudent (though it is profitable so Amtrak may not want to part with it). Shoreline East should be extended for sure, but not to Westerly, it should be extended to Hyannis. If we act regionally, we can act big. Blackstone Valley service is obvious, but not to Woonsocket, to Worcester, or Leominster. RIPTA meanwhile should expand regionally to take over services for SRTA (New Bedford/Fall River) and GATRA (Attleboro/Taunton). It makes no sense to have these little transit agencies struggling to survive while RIPTA is actually very good at running buses and those areas are inside our metro area. And as long as our transportation agencies are hampered by state lines, our state line straddling metro area will suffer. I again commend Peter for starting off a worthwhile discussion touching on how to best use our rail infrastructure and maybe help establish priorities. My oberservation is that rail advocates generally have supported everything: commuter rail extensions to South County and to the Blackstone Valley; infill stations on existing service; the Providence streetcar; an Amtrak stop in Warwick; more use of the Aquidneck Island line. And Peter has introduced a fine vision of how a shuttle service might work. I emphasize that except for a few studies that none of the above is funded and even existing services are in jeopardy due to MBTA debt, RIPTA’s current $8 million operating deficit not addressed by the recent General Assembly, RIDOT’s backlog of expensive bridge work, anti-transit initiatives by the US House Republican leadership and Mitt Romney’s proposal to eliminate Amtrak. But there is also a lot of support for improved transit so there is reason for hope. After this discussion above, I still feel short-term priority is to get infill stations built in Pawtucket and Cranston for the current MBTA service since studies are further along, there is real community support, and connecting Pawtucket to the Boston market (and to Providence by express which RIPTA doesn’t provide??) seems very worthwhile. I think South County extensions can wait, they are served by $2 bus fares to Providence (same as the fare South Providence to Providence) with high frequencies on the #66 line . Best way to help Westerly for now is to negotiate commuter rates on Amtrak since they usually have plenty of empty seats to fill, their service is so oriented to New York. Of course a New England-wide Verkehrsverbund is a good idea, but it has to include local bus and rail services and not just mainline rail. It’s time to stop thinking of mainline rail as special and separate from other modes of public transportation. So to this end it’s actually more important to keep MBTA commuter service aligned with Boston’s city transit, and expand compatibility there (e.g. by integrating fares properly). Intercity compatibility is still feasible, if agencies stop protecting turfs so much. The MBTA does it internally, and has just worked out unified ticketing from Worcester to Boston, including bus transfers at both ends (no CharlieCard yet, alas). The other thing that has to go is the state-centered thinking that leads Massachusetts to connect Fall River and New Bedford to Boston but not to Providence, and Rhode Islanders to want to connect Westerly to Providence but not to New London or Norwich. Worcester just adopted the Charlie Card for their local buses, so good news on that front. Jef: All the way to Hyannis on Shore Line East? Why? Hartford – Providence – Fall River – New Beford – Hyannis on a Cape Cod Regional accomplishes the same thing except for serving all of those towns about twenty times better than SLE through Kingston (and Wickford Junction, T.F. Green, Providence, Pawtucket/Central Falls, South Attleboro, Attleboro, [I’m forgetting Something Here], Taunton, [More Forgotten Stops], New Bedford…) to Hyannis. 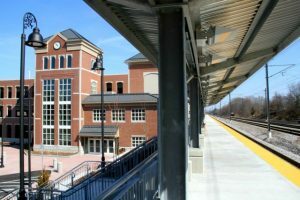 Alon: South County Commuter Rail connects Westerly to Providence, New London, and Norwich. It closes the transit gap on the Northeast Corridor that creates the ridiculous situation where one must board a Regional to go one, two, or three stops – Kingston, Westerly, Mystic, New London. That should not happen. I must issue a retraction: South County Commuter Rail would NOT connect to Norwich without the use of a feeder bus or branching service Westerly-Hartford. That one’s on me, I didn’t properly examine the map. You just can’t go Hartford-Providence-New Bedford-Hyannis. The tracks have been cut in multiple locations and restoration between Providence and New Bedford especially would require lots of new civil infrastructure. East of New Bedford there’s nothing at all that can connect to Hyannis. The southernmost extant track that can connect Providence to Hyannis goes through Middleborough and Taunton. And boarding a train to go 3 stops is pretty normal. The problem is 100% that Amtrak’s expensive and thinks everyone should reserve tickets in advance. Alon: The South Coast Rail project that would connect Fall River and New Bedford to Boston is such a money pit that I’m not convinced connecting both cities to each other and Providence wouldn’t be orders of magnitude cheaper in the end. I like to think of Amtrak as the future “distance train” service, with commuter rail and local services handling shorter trips. There’s no reason whatsoever to stop an Amtrak train at, for example, Mystic Station, if there’s a commuter rail serving it instead. I’m convinced that the Shore Line East extension is what will kill Mystic as an Amtrak stop. 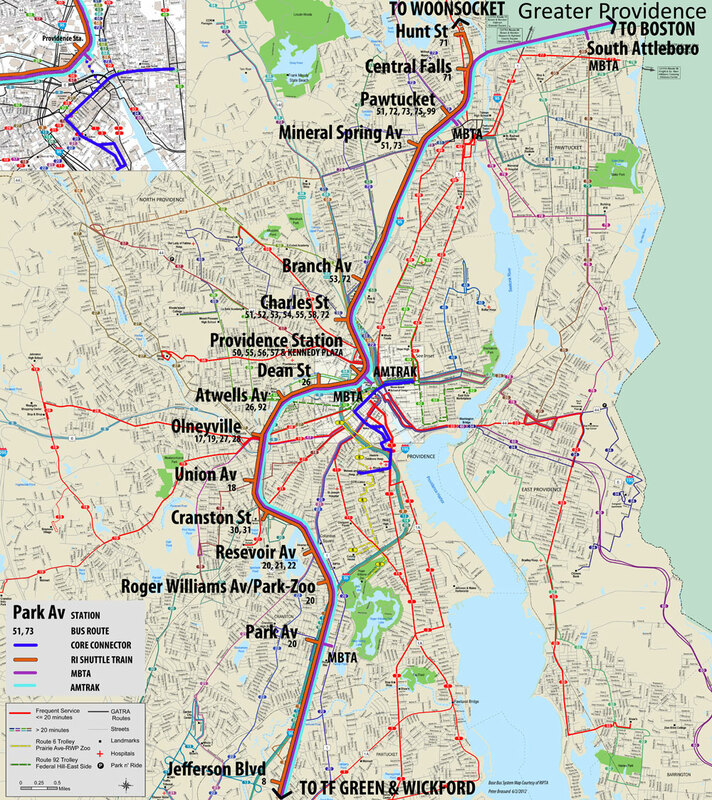 Rhode Island Railway Trans-State (Woonsocket -Westerly) Trans-Metro (Woonsocket-Wickford Junctions & Woonsocket-Quonset Point) Commuter Rail Rapid Transit Lines.